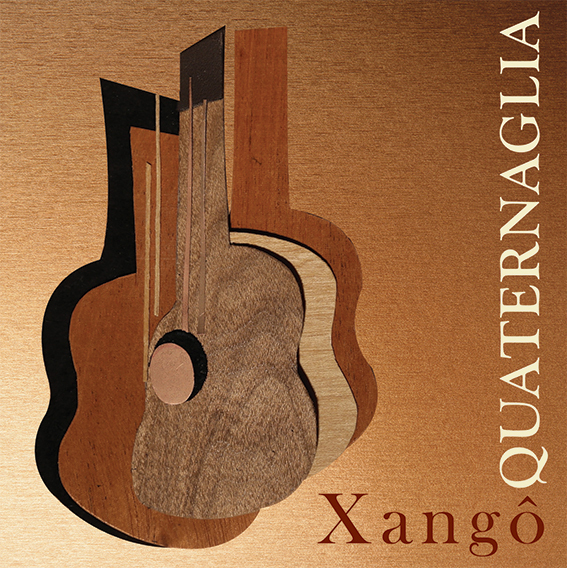 In Variações sobre o tema de Xangô, Almeida Prado’s compositional approach transcends the bounds of the nationalist school and anticipates the rhythmic virtuosity and intuitive spectralism that would emerge from his contact, in Paris, with Olivier Messiaen (1908-92) and Nadia Boulanger (1887-1979). The titles of his fourteen short variations map the spectrum of Brazilian affectivity: following the slow initial theme are I-Calm, II-Distant, III-Passionate, IV-Cheerful, V-Wistful, VI-Nostalgic, VII-With Humor, VIII- Tearful, IX-Jumpy, X-Serene, XI-Gracious, XII-Tender, XIII-Agitated, and XIV-Festive. Prepared by the composer for the celebration of his sixtieth birthday and premiered in the city of Curitiba in 2003 – occasion in which it was publicly dedicated to Quaternaglia – the version for four guitars incorporates an additional melody for bassoon conceived by Prado in 1998. Quaternaglia had long searched for a path into the aural universe of Rio-born composer Ronaldo Miranda. Boasting a large and diverse oeuvre – which includes symphonic and operatic works – Miranda is the author of important pieces for guitar, including a concerto for four guitars and orchestra and the Appasionata, a favorite of Brazilian soloists today. Suite n.3, for solo piano, was composed when Miranda was still a student of Henrique Morelenbaum at the Federal University of Rio de Janeiro. In 1979, the piece was chosen by composer César Guerra-Peixe (1914-93) to be edited by the publisher Irmãos Vitale. This work served as inspiration for the guitar quartet adaptation produced by Quaternaglia member Chrystian Dozza. Instrumental composition and popular song have equal prominence in the creative opus of Sergio Molina. His album Sem pensar, nem pensar (2010) was catalyzed by a set of unpublished lyrics by Itamar Assumpção (1949-2003) – one of the most important popular artists of the 1980s São Paulo vanguard. Molina’s collaboration with Quaternaglia began in 1998 with Sweet Mineira – recorded on CD and DVD – and continued with The Journey of the Weary Souls (2004) for four guitars and string orchestra, Quintet for Another Time (2006), for fours guitar and piano, and Down the Black River into the Dark Night (2008), for four guitars, piano and string octet, all premiered by the quartet in international festivals. Neverending Song (For Sounds without Words) makes use of formal and auditory devices inspired on the mature work of Leo Brouwer and incorporates elements of popular urban traditions in a subtle game of citations. References to Richard Wagner’s (1813-83) “Im Treibhaus” (“In the Greenhouse”) – the third of the Wesendonck Lieder – and to Beethoven’s (1770-1827) piano Concerto n.4 are especially worthy of note. The work of guitarist and composer João Luiz is a decisive presence in this album. Currently working in the United States, Luiz was a member of Quaternaglia for a total of seven years and his arrangements of both Villa-Lobos’s Choros n.5 and Variações sobre um tema de Xangô were produced while he was a member of the group. A substantial part of Luiz’s recent compositional production has been aimed at four guitars and is dedicated to Quaternaglia: Modinha allies an elaborate contrapuntal structure to echoes of Debussy (1862-1918); Urbano advances the rhythmic virtuosity of Luiz’s earlier arrangement of Danzas Argentinas by Ginastera (1916-83); and Kirsten is a beautiful love song inspired by the toada form, from the interior of Brazil. Urbano is also influenced by O Ronco da Cuíca, a samba by popular guitarist and composer João Bosco. Egberto Gismonti and Paulo Bellinati have frequently collaborated with Quaternaglia over the course of more than twenty years of activity. While the former has dedicated significant pieces to the group like Forró (1996) and produced the CD Forrobodó (released in Europe), the latter is the author of some of the most appreciated works in the guitar quartet repertoire, including Baião de Gude, A Furiosa, Lun-Duos, Frevo e Fuga, and Carlo’s Dance. Encouraged by Chrystian Dozza, Bellinati prepared a version of the Maracatu da Pipa – originally written for guitar trio – specifically for this album. Based on a stylized blues, the piece explores two of the most traditional maracatu styles of the Brazilian northeast: themaracatu nação and the maracatu rural. Gismonti’s presence, on the other hand, is felt in an authorial work composed by Dozza himself called Sete Anéis: On a Theme by Gismonti. This work – praised by Gismonti himself – is Quaternaglia’s first time recording an authorial piece by a current member of the group. Bookending this CD, Villa-Lobos is the gravitational center of Brazilian music. Little more than fifty-five years after his death, he has acquired a mythical status for his attempts to dialogue directly with his European predecessors. If the Choros introduce Brazil to the world, the Bachianas Brasileiras brings traditionally Western compositional forms to Brazil in a novel, energetic way. Choros n.5, “Alma brasileira” represents the meeting point of Brazilian popular piano, Liszt (1811-86) and the impressionists (emphasized in João Luiz’s guitar quartet version). Bachianas Brasileiras n.9, originally written for string orchestra and beautifully arranged for guitar quartet by conductor Thiago Tavares, amalgamates Bach’s contrapuntal style with an epiphanic Brazilian fugue structured upon an eleven-beat meter.